As development pops up across the state, what's happening to Ohio's century-old farms? There is a push from Columbus to make sure some of Ohio’s oldest working farms remain a part of the state’s future. According to the Ohio Department of Agriculture, farming is a $120 billion industry when you include total investment. 1 out of 8 residents works in the industry, which is the largest in the state. Janet Haueter’s family has been a part of that industry since 1915 when her grandparents bought a farm in Huntsburg that was built in 1841. "It's definitely been a part of me my whole life, as a little girl I came up here and they let me drive the draft horses," said Haueter. A 170-year-old barn on Princeton Road that used to house cows for dairy production now holds the farm's hay. Janet's newer barns are home to roosters, horses and alpacas. The Haueter Farm is one of 15 centennial farms in Geauga County and more than 1,400 throughout Ohio. Ohio’s Department of Agriculture works with farms like Haueter's to make sure they are protected and preserved with many that are a few miles of new development. “That's what's unique about Ohio,” said Mark Bruce, who is communications director for the Department of Agriculture. “Agriculture and development really are close all over the state so it's critical we find ways to allow it to work." In addition to the centennial distinction from the state, Janet applied to the Western Reserve Land Conservancy which now guarantees her farmland will remain undeveloped, even if its eventually sold by her children or grandchildren. “I did real estate for 10 years and it killed me to see these farms broken up,” added Haueter. “So we have to save these things, it's very important." 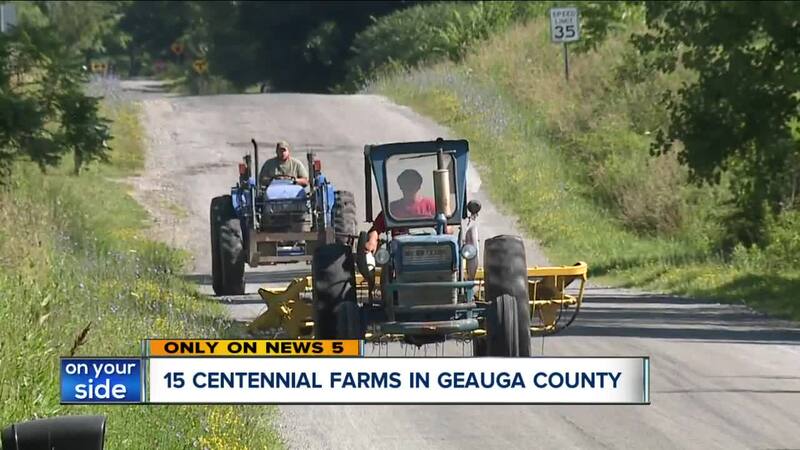 Each of Ohio's 88 counties now has at least 2 Centennial farms including Cuyahoga County, which has two as well.